We had spent about 18 days out and about generally biding our time waiting for our buddy Rob to be available to install our a/c unit. The cab on the 1017A did/does not have air conditioning and it makes travel during the summer, particularly in the south, somewhat arduous. Rob and I had agreed on the installation method and the start date, so all we had to do was to return to La Junta, CO and get busy. 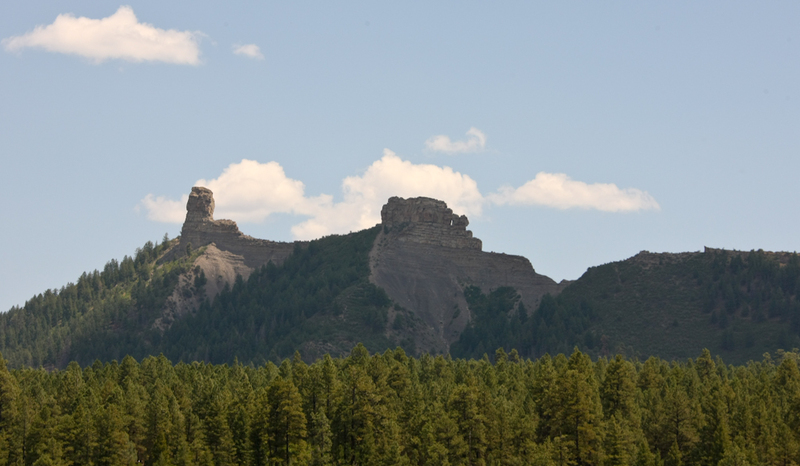 First, of course, we had to get from Durango to La Junta which took 2 days. 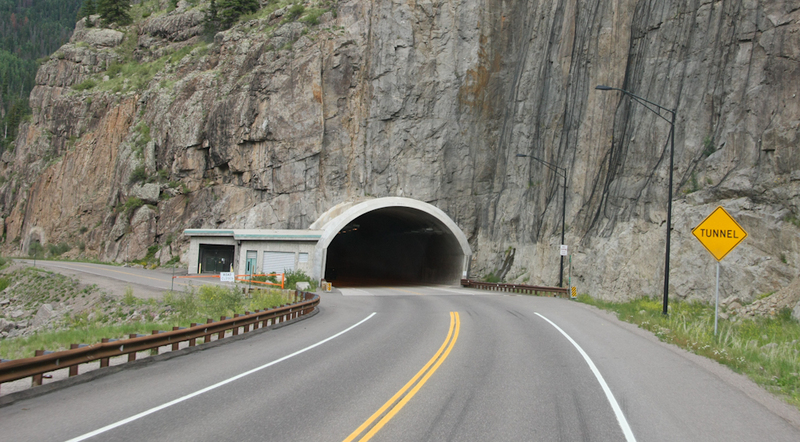 Heading east from Durango took us over Wolf Creek Pass which was very nice. The pass was steep but not that narrow as it is a heavily traveled road. Because of Rob's previous obligations, we did not have to get to La Junta until Sunday pm. 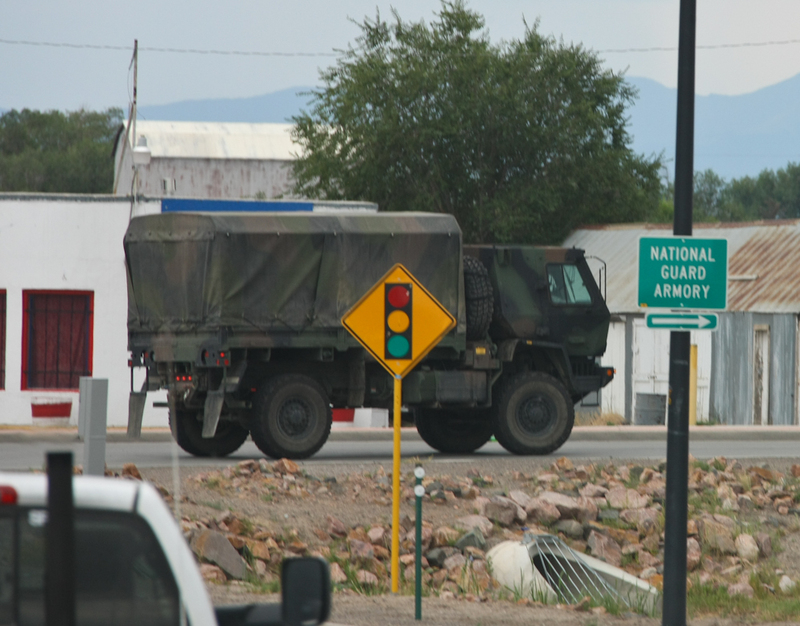 So, we elected to stay at the KOA in Alamosa, CO. On the way, this LMTV passed us on his way back to the armory. Next morning, we left Alamosa headed for La Junta and got a nice view of Blanca Peak, one of Colorado's "fourteeners" (over 14,000 feet elevation). We spent the night at Rob and Erin's place and Monday, after breakfast at the local cafe, we started to work. 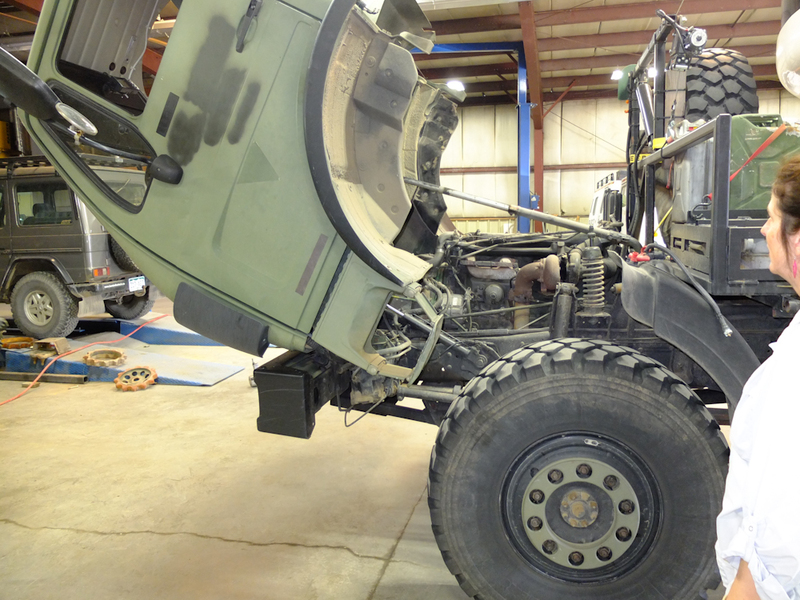 The unit we selected for the a/c is used for heavy equipment such as dozers and graders. 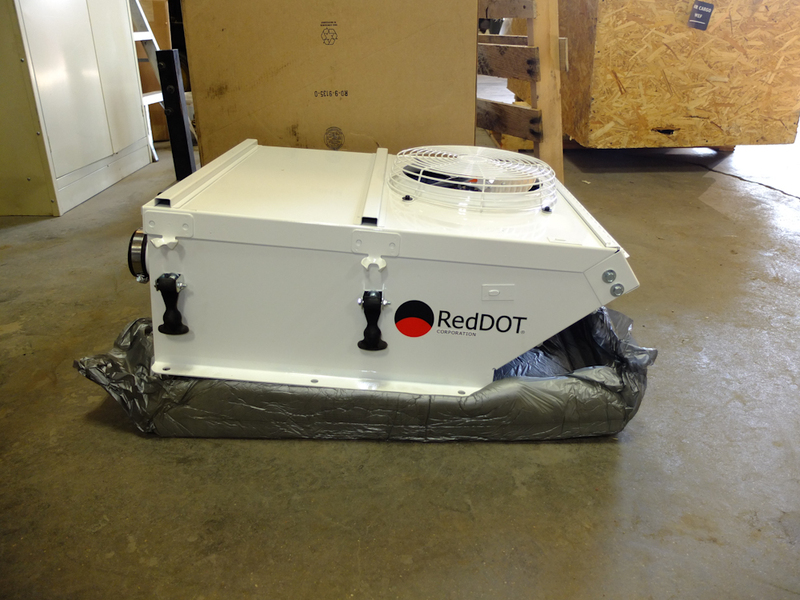 It is a 24V roof-top mounted unit that only needs electrical power and having the compressor hooked to the engine. 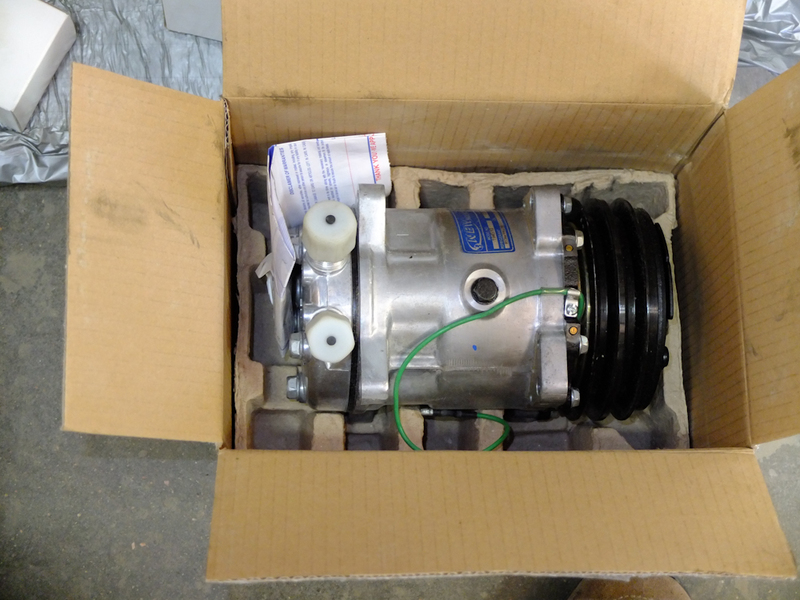 The compressor is separate and will need to be mounted on the engine for power via a standard belt and a race on the crankshaft. 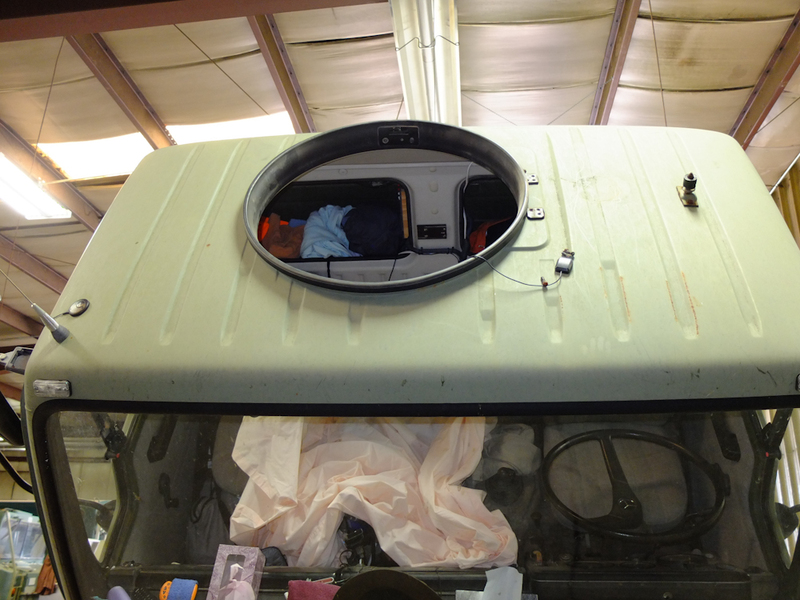 The a/c unit will be mounted on top of Thor's gun turret. Above the turret has been removed and is being marked for cutting. Edwin, one of Rob's guys, cuts the roof hatch with an air-powered saw. Meanwhile, Rob was helping with our Honda generator which had decided to go on the fritz. 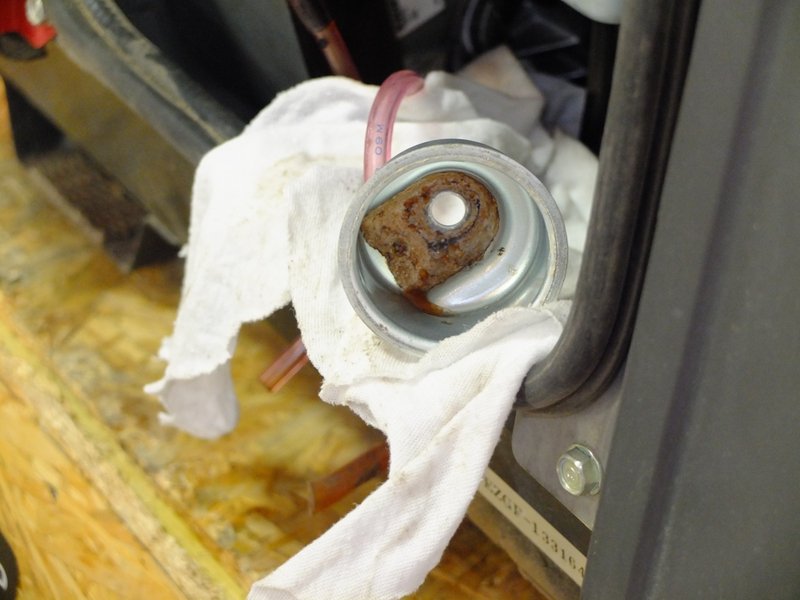 Above is the sediment cup for the carburetor. Note the crap in it. The generator would not start. 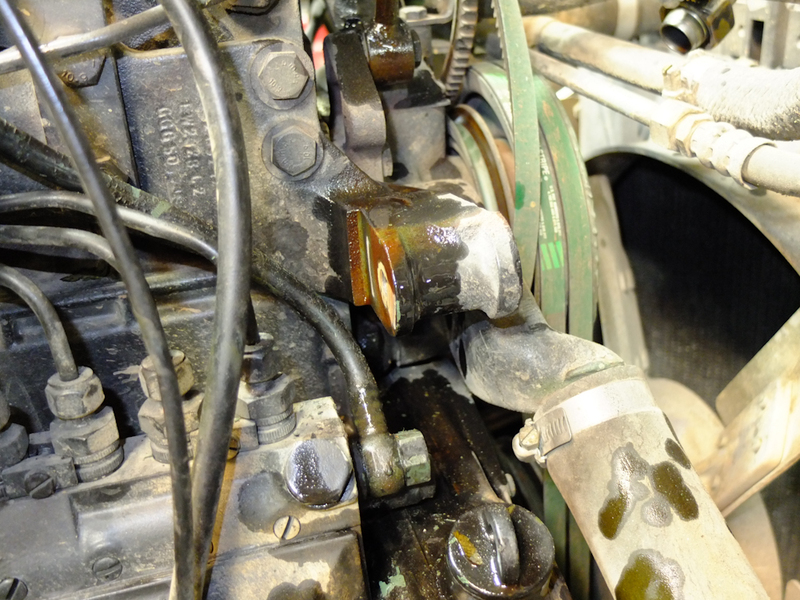 In the end, we gave up as it seemed as if some of the issues were part of the electronic ignition controls. We will get it repaired in San Diego. 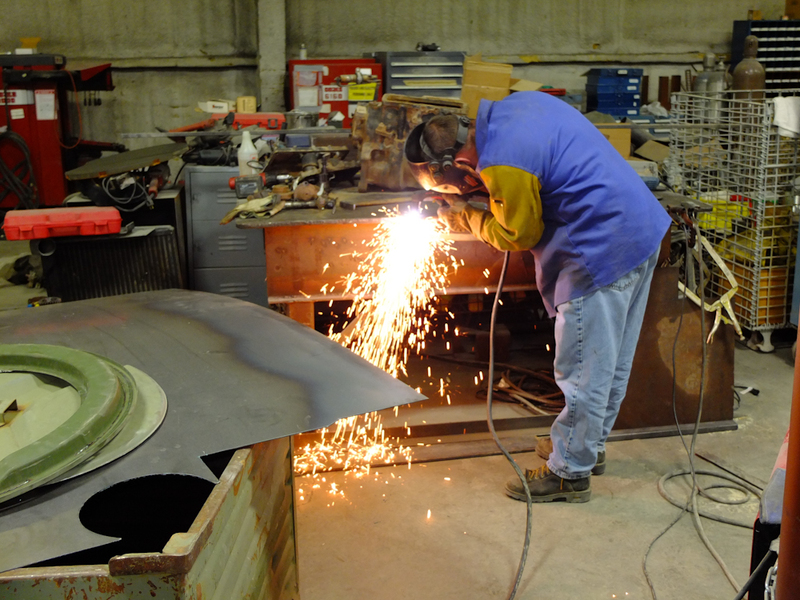 Edwin is nearing completion of the cutting task. 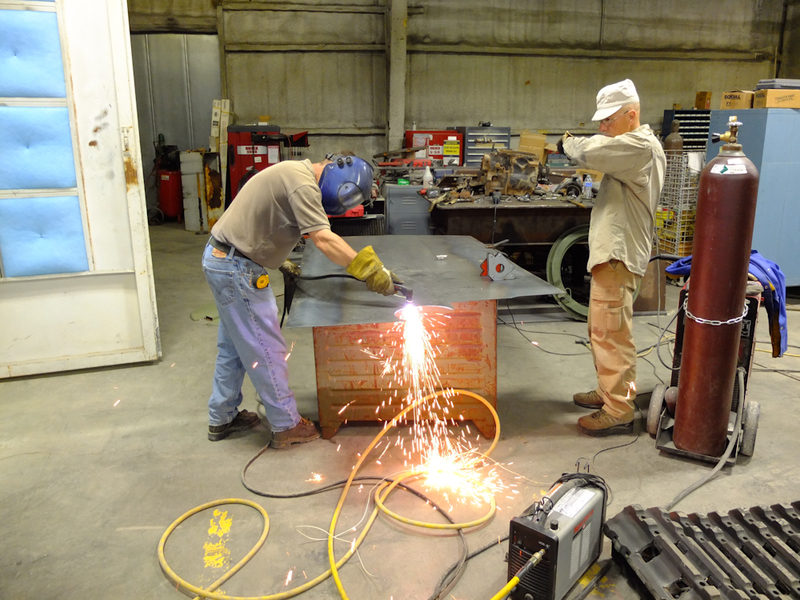 We had to tilt Thor's cab to allow access to the belts and to install the compressor mount. 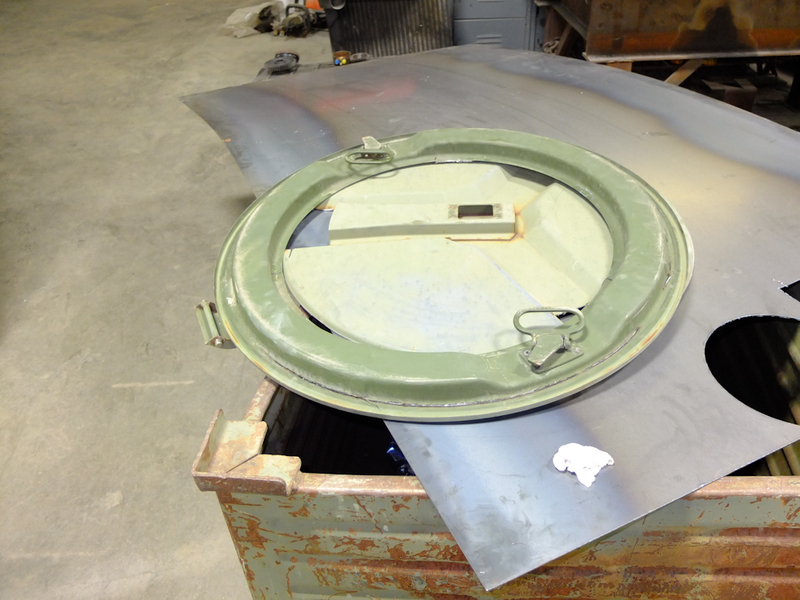 The roof turret hatch has a nice rubber gasket around the edge and should seal up tight. 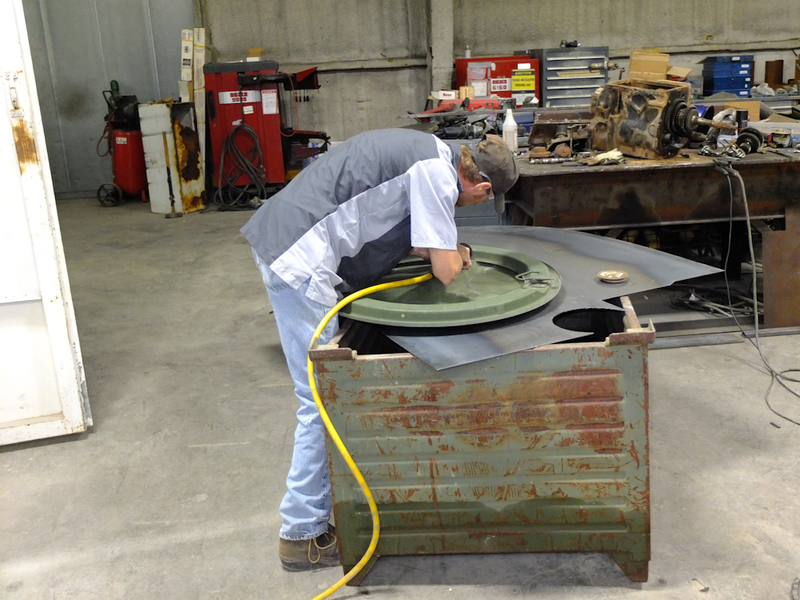 The hatch roof has been cut off and a piece of plate will be cut and welded onto the hatch to provide a mounting surface for the a/c unit. 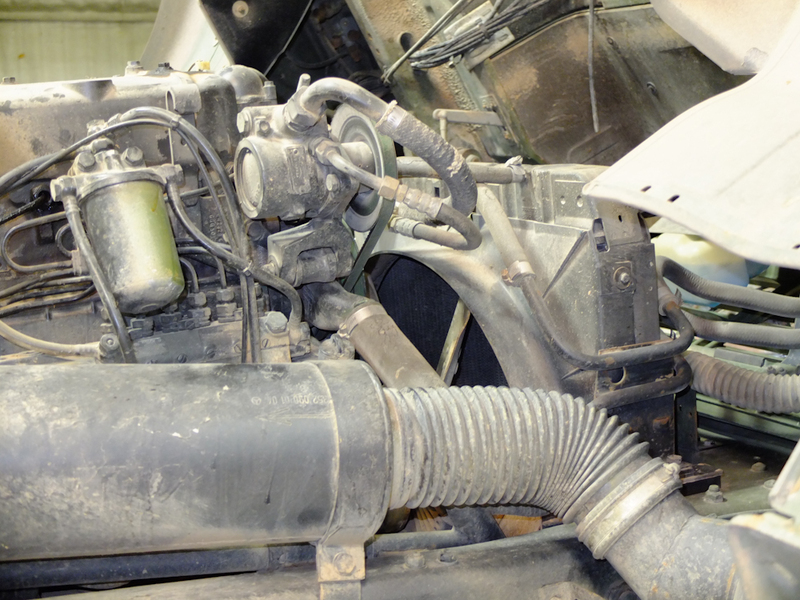 The power steering pump is visible above. 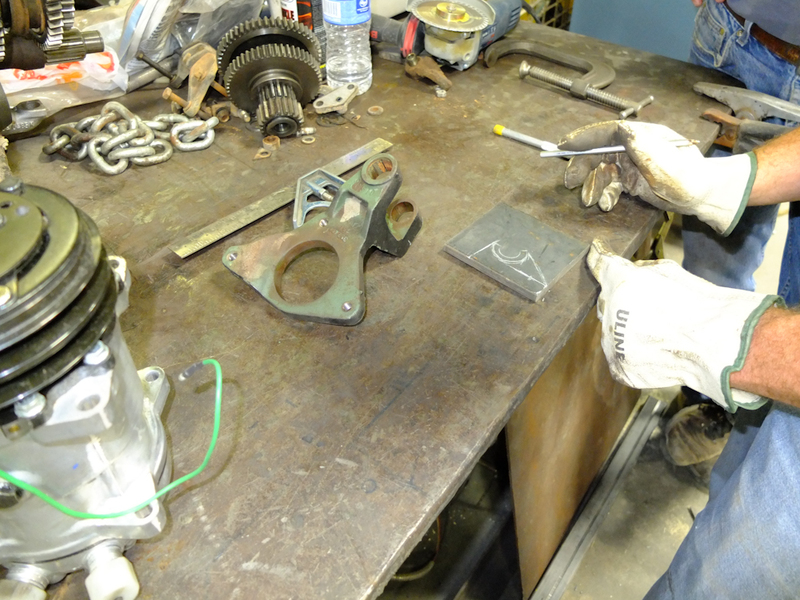 The plan is to build some "ears" onto the existing pump mount that will allow the compressor to gain access to a belt race. It will be a tight fit. 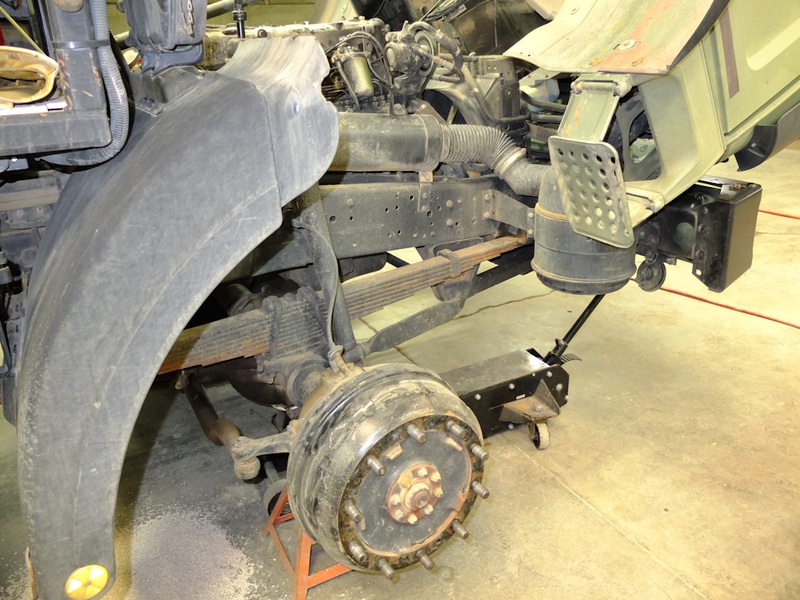 To gain the required access, the front wheel had to be removed as well. 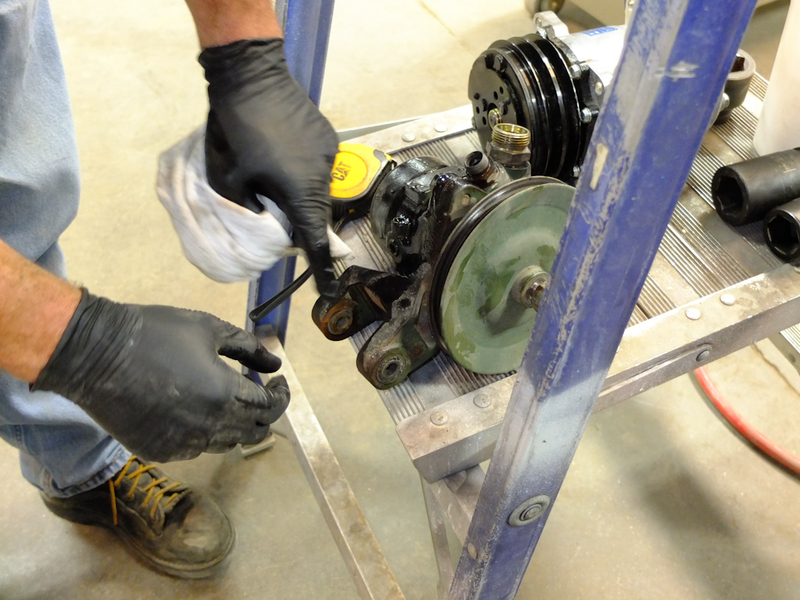 Rob does a test fit of the compressor as seen from above. 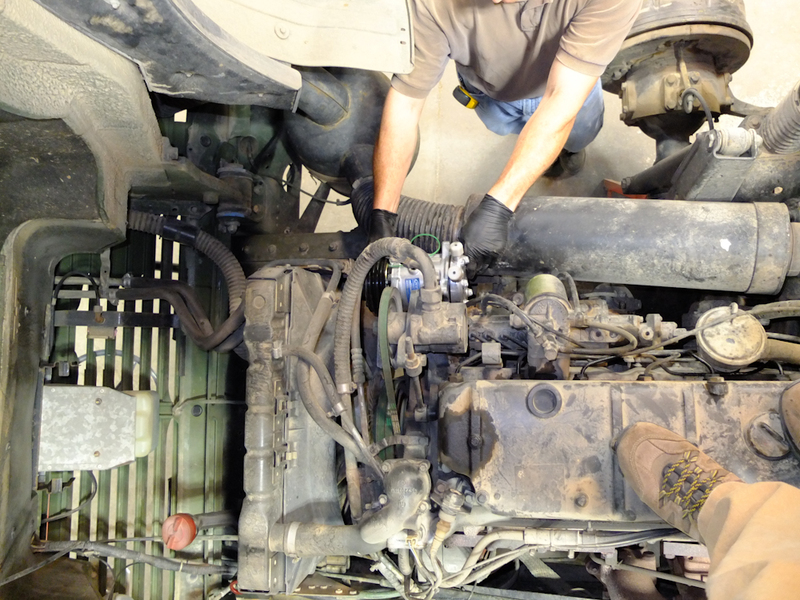 The power steering pump, bracket and hoses were removed. The cast mounting is visible in the photo above. Rob points out where the new ears will be located. 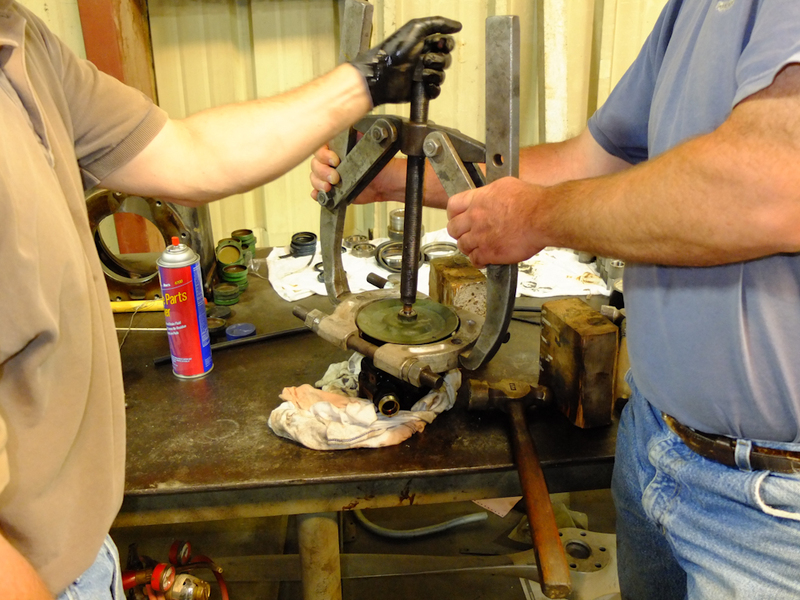 To get the pump off the bracket to do the necessary welding, the pulley had to be removed. 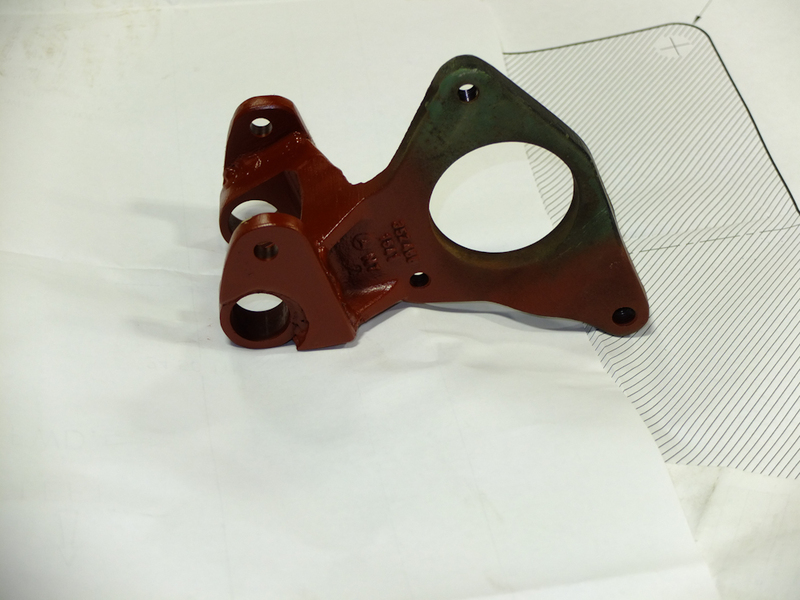 After the pulley was removed and the rubber mounting bushings were pulled, the rough outline of the mounting ears were sketched out. 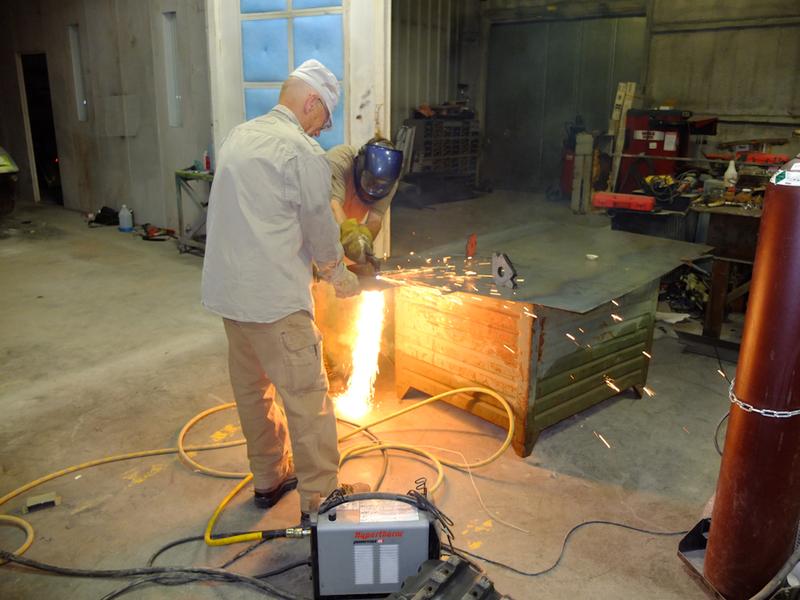 A plasma torch was used to cut the plate. 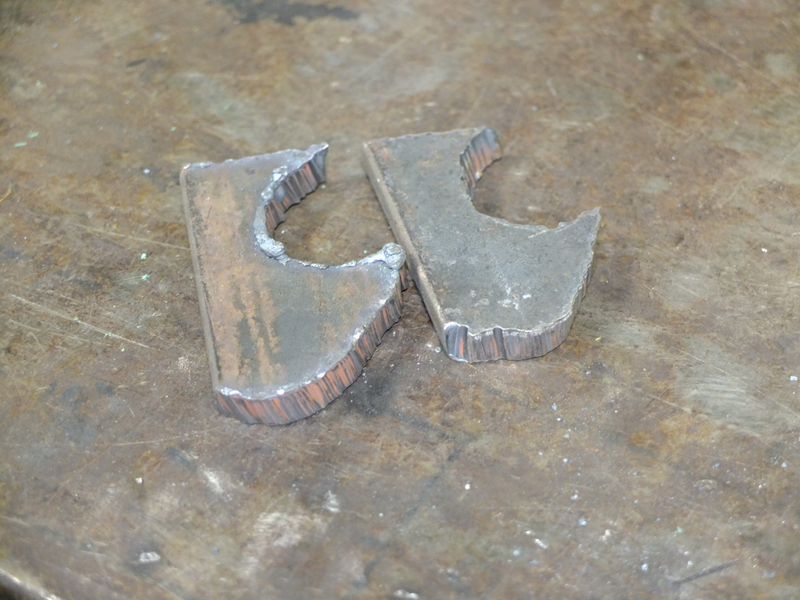 The ears prior to finish grinding. 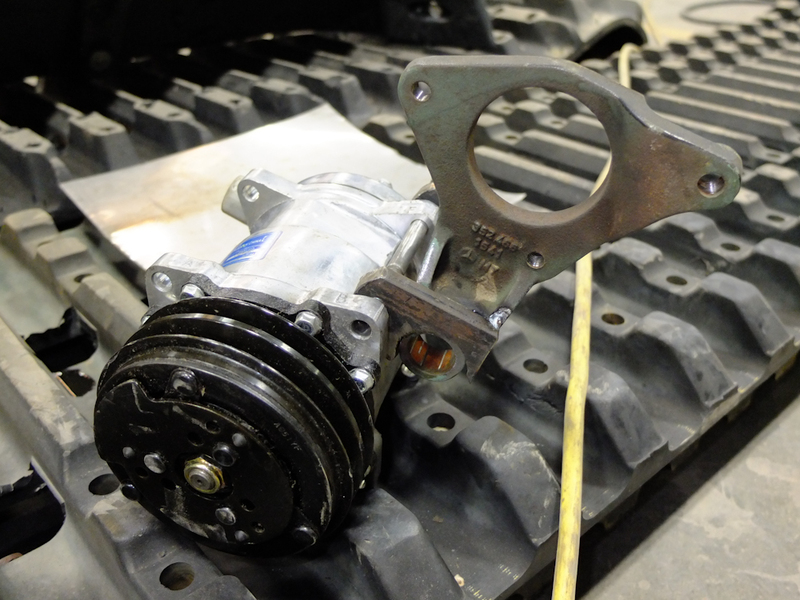 The ears are test-fit on the existing power steering mounting bracket. The ears were tack welded and another test fit was performed. 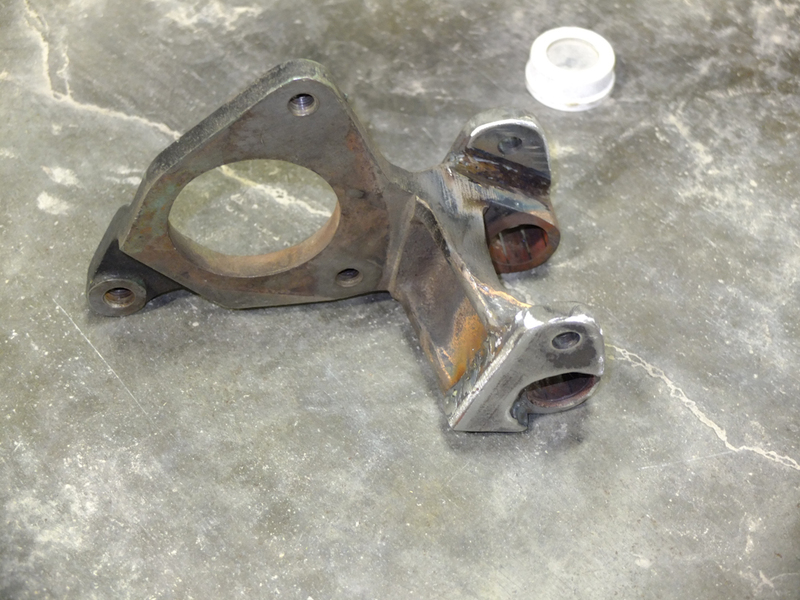 We discovered that we had bent the bracket during the extraction of the rubber mounting bushings. So, we built a screw press and bent them back into the correct clearance. The finished bracket was ground flush. 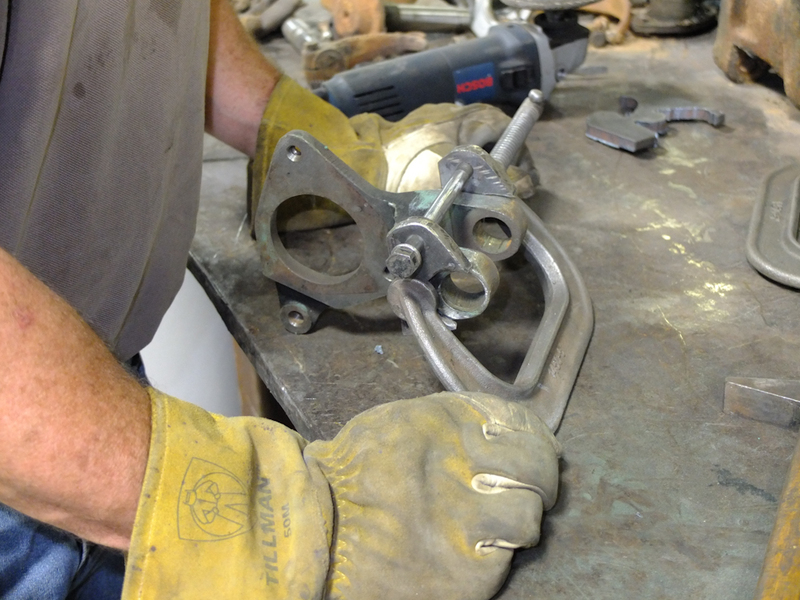 The bracket was primed in preparation for painting. 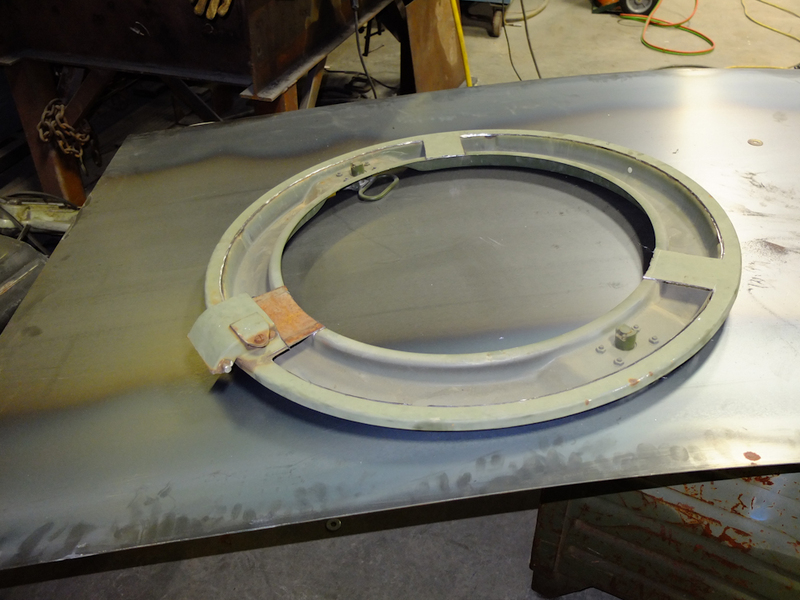 The hatch preparation was completed for attachment of the sheet metal. 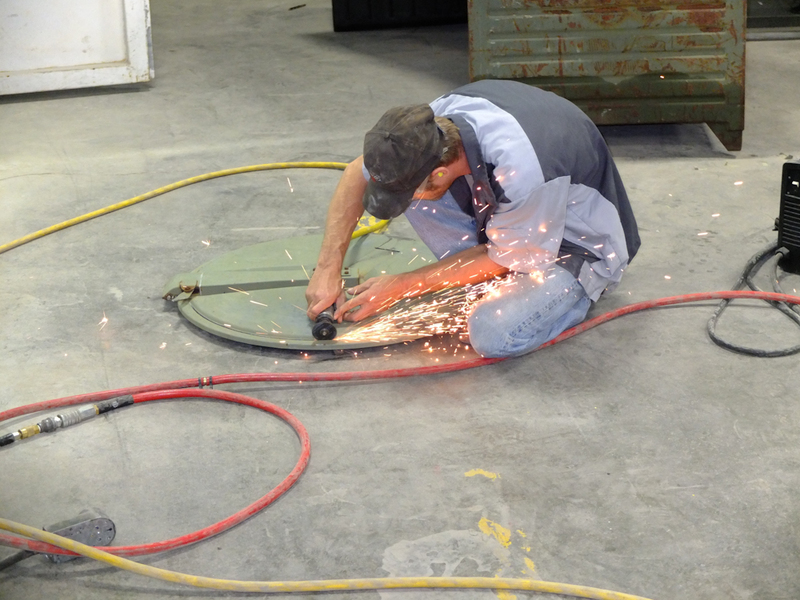 I assisted Rob in cutting the hatch cover. All I had to do was apply the large magnets to prevent the metal from falling and bending as it was fully cut. The far side of the cover was cut and secured with the magnets, now I had to support the outer portion of the cut. We made good progress on our first day of effort. 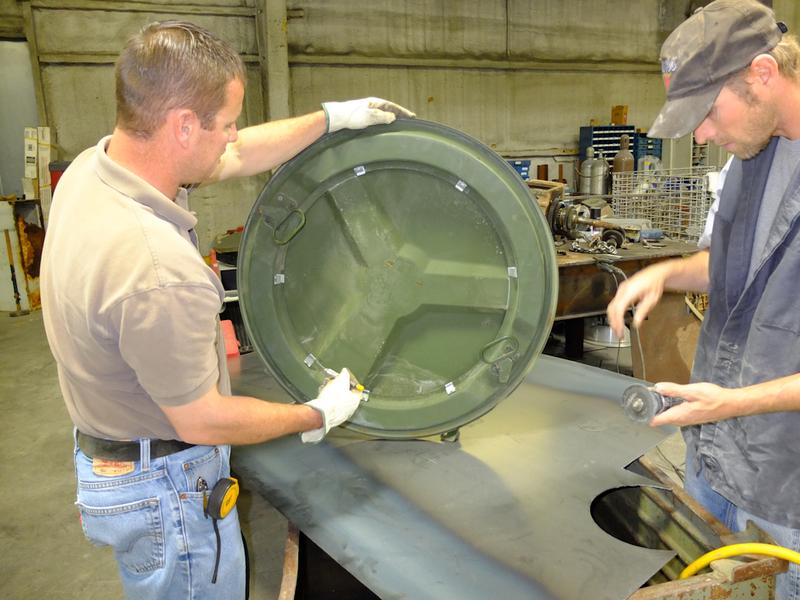 Tomorrow, the hatch will be completed and the compressor will be installed on the engine. Photos and Text Copyright Bill Caid 2012, all rights reserved.